We have been hearing forever that 131 Main was the place to go, and sure enough when we finally rolled up not long ago there were tons of people waiting to eat. I was excited, something this busy couldn’t be bad, right? Eh. I was quite let down. Once we were finally seated, it was so dark inside we could hardly read the menu. This always vaguely annoys me. We decided on our menu orders and placed them with our frazzled waitress. We sampled the Deviled eggs for an appetizer. I found them to be a touch too vinegary for my liking. They were pretty to look at, however. For my entrée I had the Cajun Penne Pasta. It came with shrimp, tomatoes, scallions and sour cream and in a spicy cream sauce. It was pretty tasteless on the night we went. 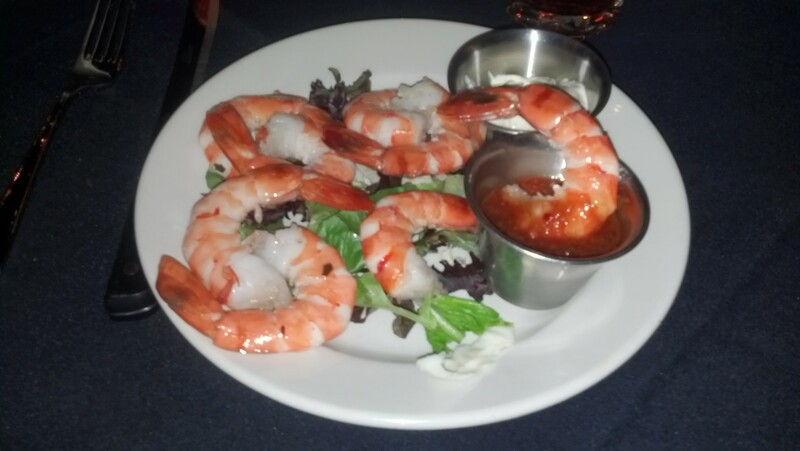 The shrimp were nicely cooked, but the whole dish was very bland. I was quite disappointed. My friend had the Slow Roasted Chicken with Smashed Reds. I didn’t get a bite, but she did seem happy and I thought the potatoes were creamy and rich. My husband got the meatloaf with mashed potatoes and vegetables. The gravy was a creamy, mushroom gravy that was delicious, and he enjoyed the meatloaf, but it tasted as if it had been grilled to me. For his vegetable he chose a cucumber salad. Yuck. Dessert was a Brownie Sundae thing. Chocolate is great, but this brownie was a bit dry. We were just not impressed. At all. I may go back at lunch to see if my experience is any better, but I’ll not brave the throngs again at dinner to eat here. Well, we capped off another Restaurant Week in style. We visited Alton’s Kitchen and Cocktails in Cornelius at the recommendation of one of our clients and we were not disappointed. Alton’s is located in what was once Charleston Chops, and the building is updated, but still richly appointed. It has, most notably two flowing staircases at either end of the restaurant, which while beautiful, did become tiresome watching harried servers race up and down all night. Maybe a dumbwaiter and a server or two just stationed upstairs? Restaurant week is a lot like Valentine’s Day. Super busy, with a prix fixe menu for the masses. It isn’t really fair to judge a restaurant by normal standards during these times, but if that is when you visit, well…you gotta report. Alton’s did pretty well. We had some issues with timing and a hide-and-seek server who let our drinks get low, but other staff made up for these few snafus. When we needed a fork, another server was glad to retrieve it. Same with the drinks. BUT, I despise having to flag down a server to get what is obvious to the eye if you’d simply walk by a time or two. Another irritant was that our dessert was brought out perhaps 15 minutes later than our dining companions, despite my having ordered my bread pudding with my meal (the prix fixe menu). Just as we were getting restless, the chef came to the table to explain that they had run out of bread puddings, and had to bake more fresh. She offered to bring us something while we waited and to just pack our bread pudding up for us to take home. We opted for the ice cream sandwich, which was delicious. I appreciated the chef meeting the problem head-on and offering us a workable solution so our companions didn’t have to sit there and wait longer than necessary. I digress. When we were seated, a waiter immediately greeted us and brought us a carafe of water and took our drink orders. They actually had “sweet tea” which I commend them for because many nicer restaurants only offer unsweetened tea. The only comment I can make that may leave room for improvement is that the water could use some ice. Our appetizers were delicious. We ordered Lobster bisque, tuna poke and shrimp cocktail. I had the shrimp cocktail, and it was truly one of the better ones. They used Jumbo Shrimp, and they were perfectly poached, not too chewy. 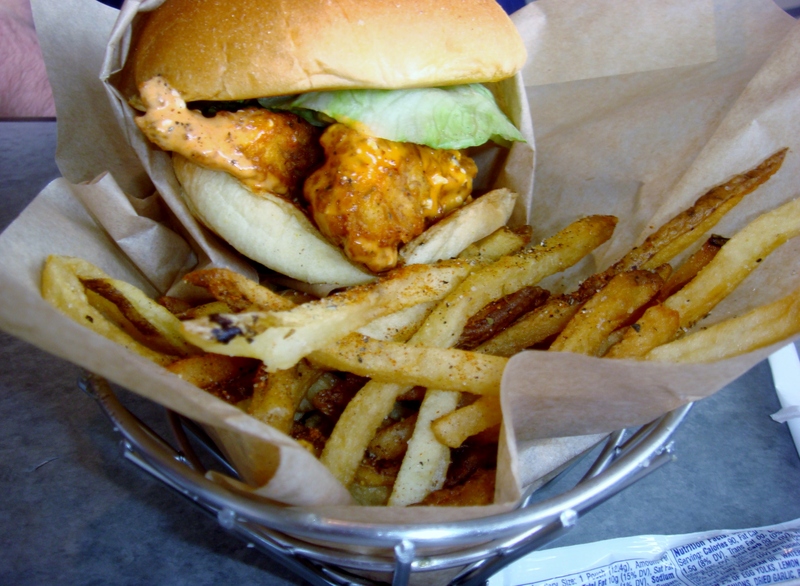 They served it with two sauces, a typical cocktail sauce and a tartar sauce. They were both tart and tangy, but I preferred the typical cocktail sauce. Both my diners proclaimed their appetizers to be delicious. Update March 2016: I visited with my Girls Nosh group and we had a much better experience. Everything was delicious! The Prime Rib Stuffed Mushrooms were my favorites, I think. They were really huge and juicy! The stuffing had a hint of horseradish and cheese making it very creamy and rich. Divine! This is not an appetizers, per se, but my friend and I wanted to share it for our appetizer, so the restaurant kindly split it onto two plates for us. This is the Crab and Shrimp Louie. Tender seafood atop mesclun adorned with sliced avocado, tomatoes and topped with a homemade creamy and tangy 1000 Island dressing. It was delicate, but very satisfying. And very fresh. 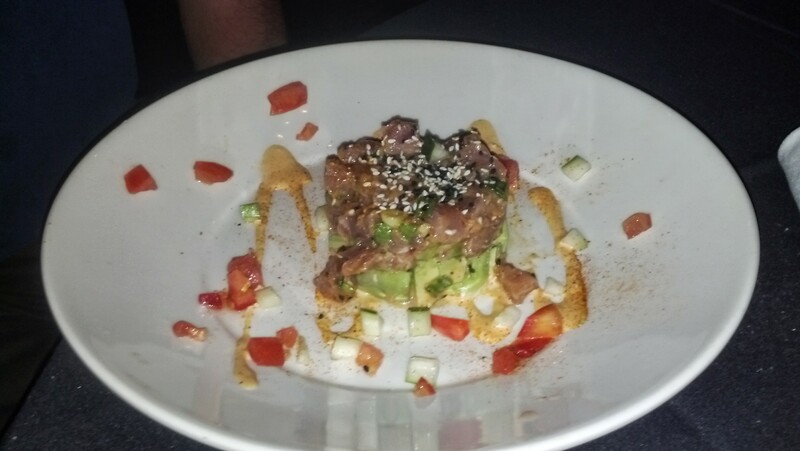 For our entrees we all got something a little different. 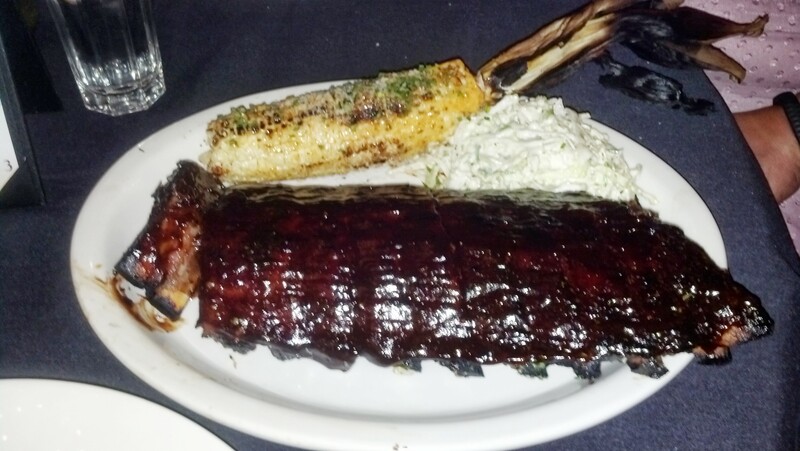 Robert got the Slow-cooked Baby Back Ribs served with chili lime grilled corn and creamy cole slaw. The spicy and smoky sauce on the tender ribs had a wonderful kick. The corn was also wonderful, with a tang from the lime and a deep savoriness from the grilling. Harry ordered a Crispy Chicken Salad. 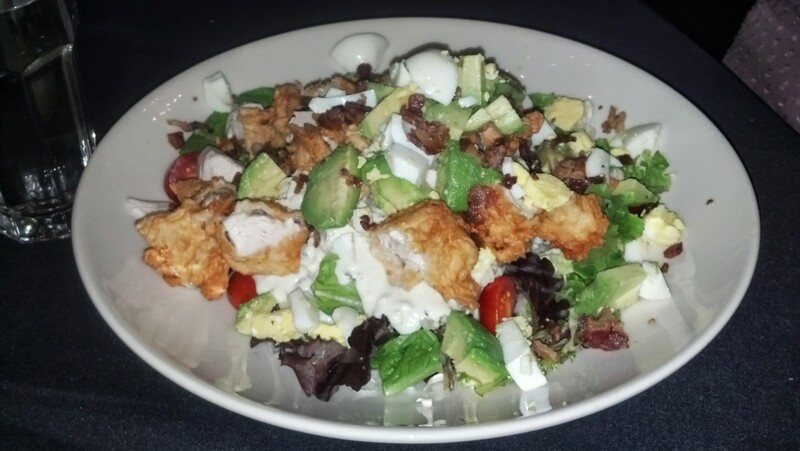 It was loaded with fresh avocado, rich eggs, bacon and draped with a creamy thick homemade Ranch dressing. 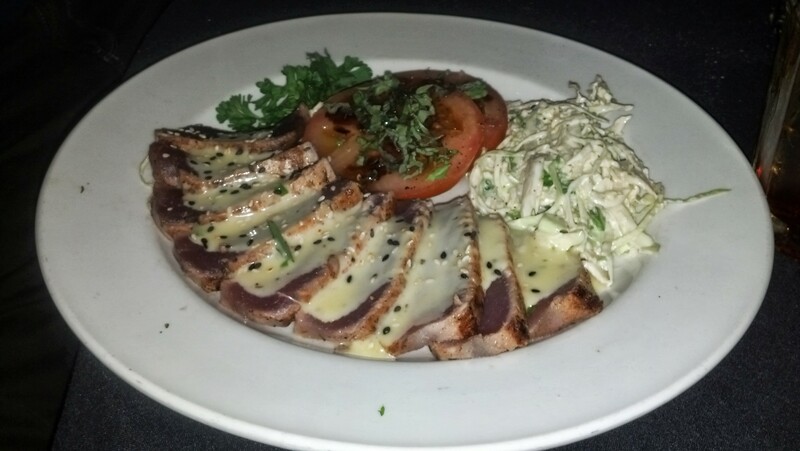 Dustin got the seared ahi tuna. It was seared lightly and crusted with sesame seeds. 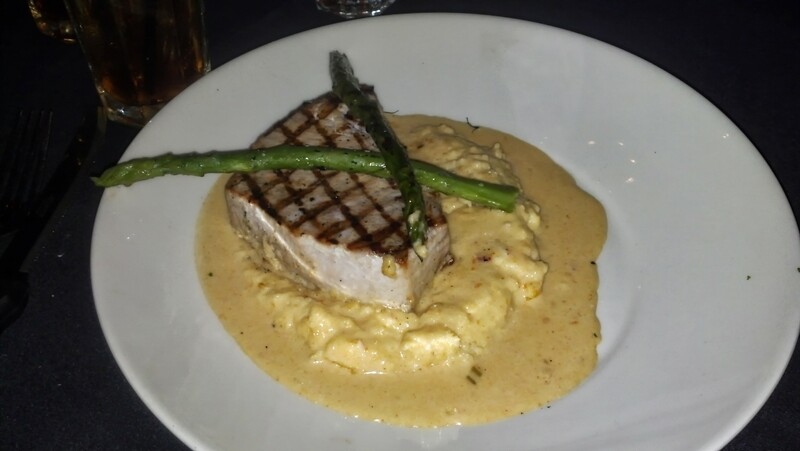 I got the grilled swordfish on cheese grits with lobster gravy. 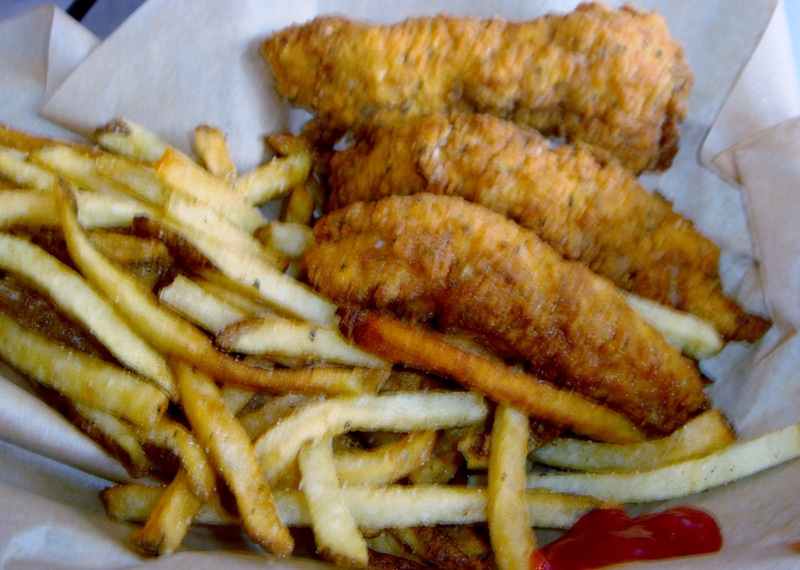 Honestly, the fish was really firm and not my favorite texture, but that wasn’t the chef’s fault. That is just the nature of the swordfish. It had a nice chargrilled flavor. What I LOVED was the cheesy, creamy grits that this fish rested on. I’m not sure I’ve ever had better grits, even in Charleston. 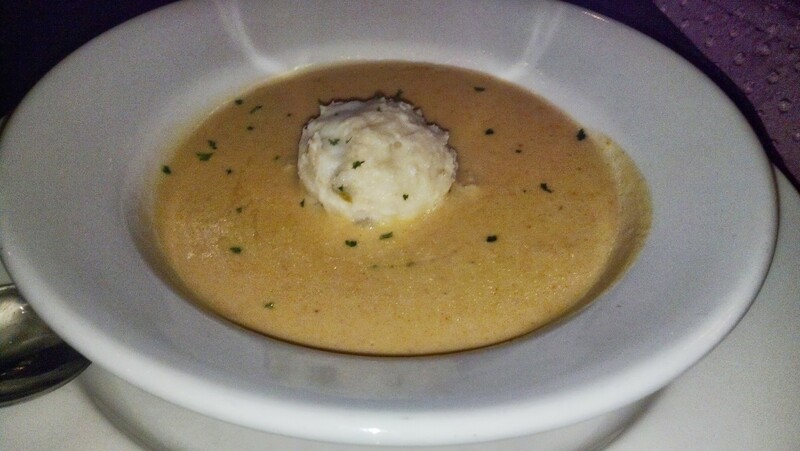 The lobster gravy was lighter than you’d think, but still creamy and flavorful. No chunks of lobster, though, which did disappoint me somewhat. Laid across the top as a garnish were grilled asparagus spears, and they were wonderful, just cooked enough. I made a meal off of the grits and asparagus. Update: On our recent visit, we sampled the filet mignon served with a twice baked potato. The filet was tender and flavorful and the twice baked potato was cheesy and rich. Perfect! On another trip during Restaurant week they featured Lobster Tail and Filet Kabob. Heaven. Jumbo Shrimp Pasta was another favorite. Big pink shrimp drenched in lemon butter and tossed with baby spinach, pine nuts and sauteed mushrooms made for a beautiful and scrumptious dish. Megan had the special of the night: Grilled Bone-in Pork Chop. The pork chop was flavorful, but Megan said it was a little undercooked at the bone. The mashed potatoes were creamy and perfect and the grilled asparagus still had a nice snap to it. Erika ordered the Pittsburgh Salad for her meal. This salad is a bowl of mixed greens topped with char-grilled filet mignon, bacon, tomatoes, blue cheese and….french fries! Erika said it was the best salad she’s ever eaten! I don’t know what got into me on this night, because I normally default to seafood or beef, but on this night I got Parmesan Crusted Chicken and I’m so glad I did. I mean, when something is fried with cheese, you just can’t go wrong. This was no exception. The chicken was crispy and seasoned well and the lemony sauce atop it was perfect with the salty capers and the sweet tomatoes. The creamy spinach served on the side was smooth and a perfect compliment for the crispy chicken. Dessert, as I mentioned, was a bit of a fiasco. 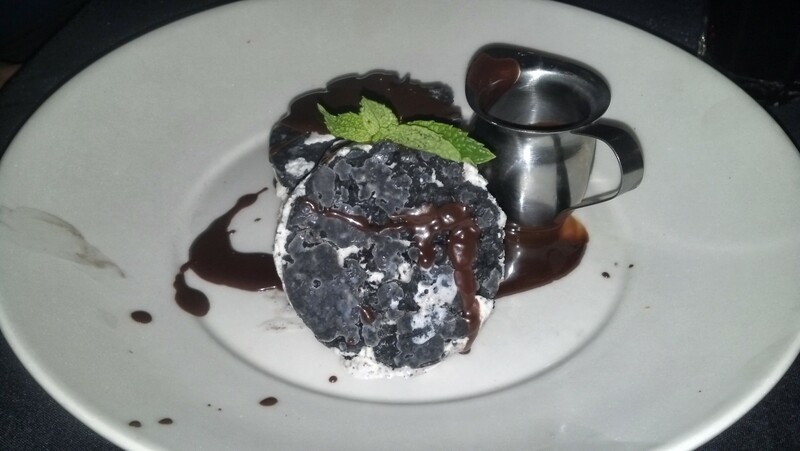 We enjoyed homemade Oreo ice cream sandwiches and bread pudding. The cookie sandwiches were delicious, topped with chocolate sauce and best eaten with a spoon instead of picking it up with your fingers. 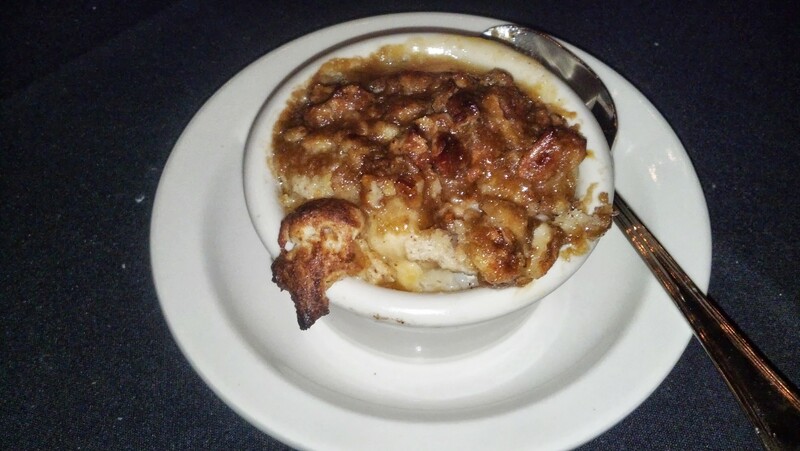 My bread pudding was merely ok. Nothing special, I’d opt for something different next time. Updated to add that the Pecan Pie a la mode is the bomb. And these little gem’s were Restaurant Week offerings. Delish! Alton’s, we all agreed, was a success. It isn’t among the best places I’ve eaten in the area, but it was good enough to visit again.